Barksdale has proudly served the Ark-La-Tex (Arkansas , Louisiana and Texas) for more than 68 years. Barksdale Air Force Base is home of the 2nd Bomb Wing, 2nd Operations Group, 2nd Maintenance Group, 2nd Mission Support Group, the 2nd Medical Group and the Eighth Air Force Museum (which maintains historical Air Force aircraft and artifacts) and the Air Force Reserve's 917th Wing. 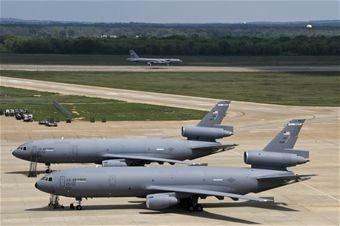 Barksdale AFB is also home to the Air Force's newest command-- Air Force Global Strike Command. AFGSC was activated August 2009 and is responsible for the nation's three Intercontinental Balistic Missile wings, two B-52 Stratofortress wings and the only B-2 Spirit wing. The 2nd Bomb Wing conducts the primary mission of Barksdale Air Force Base with three squadrons of B-52H Stratofortress bombers - the 11th Bomb Squadron (training squadron) the 20th Bomb Squadron and the 96th Bomb Squadron. Together they ensure the 2d Bomb Wing provides flexible, responsive, global combat capability, autonomously or in concert with other forces, and trains all Air Force Global Strike Command and Air Force Reserve B-52 crews. Barksdale AFB is located in the northwest corner of Louisiana and just 18 miles east of the Texas border. Interstate 20 goes right by the base, and Interstate 49 ends 8 miles from the base. Barksdale is located in Bossier City and Haughton lies just east of the base. Shreveport is due west of the base on the opposite side of the red river, next to Bossier City. Shelton and Glenna are USAA Preferred Agents and have helped many military families with their relocations. Here we provide you with information and services about Barksdale AFB Real Estate including information for military families being transferred to Barksdale Air Force Base and who are interested in information on how to buy or sell a house. Housing near Barksdale AFB offers a variety of beautiful neighborhoods in Shreveport/Bossier, Gated Communities with custom home builders and lakefront property. It is not difficult to search for homes for sale near Barksdale AFB. There are many homes for sale in the area at any given point of time. However, you need to keep three things in mind if you are searching for a home that meets your exact needs: the location where you want to reside, the home budget that you can afford, and detailed home features. Bossier City Homes make great starter homes and are ideal for buyers who do not want to spend more than $150,000 for a home. There are newer developments in North and South Bossier City and in Haughton that would also make great locations for your dream house. North Bossier Homes are still very close to Barksdale AFB. However, the homes are newer and are typically for buyers wanting to spend more than $150,000 for a new home. If your price range is around $175,000, you might consider homes for sale in Brownlee Estates. If your price range between $200,000 and $250,000, then you might want to consider Tiburon homes for sale, Stockwell Place homes, or homes for sale in Rosedale. If your price range over $350,000, then Stonebridge Subdivision would be a good place to consider . North Bossier has plenty of beautiful neighborhoods to choose from and the possibilities of a future home are limitless! The town of Haughton is 20 minutes east of Bossier City and it offers many new developments for home buyers. Haughton is a great family town and is very popular for its schools and quiet neighborhoods. Interstate 20 provides a quick and convenient commute to and from Barksdale AFB. The town of Benton is north of Bossier City and also offers many new developments for home buyers, including lakefront properties. Benton is also a good family town known for its schools; however the commute to Barksdale AFB is limited to Airline and Benton Road. Broadmoor area is part of Shreveport's most desirable and centrally located communities. The neighborhood is a mix of brick homes built in the 1950s, 1960s and 1970s mixed with small cottages built in the 1940s with character and charm. The yards are graced with mature oaks, magnolias and shrubbery. This area is also known for its safety and convenience. You can find a fixer upper starting at the $100,000 price point or you can find a remodeled, move-in ready home for up to $250,000. This central part of Shreveport is home to everything, from restaurants, to shopping, to entertainment and recreation. This neighborhood is conveniently located only a couple minutes from Shreveport businesses and just around the corner is the largest shopping district in Northwest Louisiana at E.70th and Youree Drive, as well as Shreve City Shopping Center at the other side of the neighborhood, in addition to Willis Knighton, Pierremont Health Center and LSU Shreveport . It is in one of the best school districts, and it is near large beautiful parks such as the neighborhood playground know as "The Duck Pond" , AC Steere, and Betty Virgina Park. For lovely vintage charm paired with accessibility to Shreveport's mecca of commerce, the Broadmoor area is a good option. This small slice of the city is full of charming and affordable homes with the convenience of living in the middle of it all. South of Shreveport and to the east of I-49 there is a quaint and lovely neighborhood called Ellerbe Road Estates. Homes start in the $175,000 range. The majority of these charming brick homes were built between the mid 1970's and mid 1980's. Filled with Pine Trees, they add beauty as well as shade, privacy, and some interesting bird life. This neighborhood is peaceful and only located one and a half mile from Bert Kouns Industrial Loop which provides convenient access to the heart of commerce in Shreveport, as well as Willis Knighton Pierremont and Christus Schumpert Highland hospitals to the East, or Willis Knighton South to the West by only a few miles. Caddo parish schools serving Ellerbe Road Estates are University Elementary School, Youree Drive Middle School, and Captain Shreve High School, with the magnet school Eden Gardens Fundamental Elementary and Middle Magnet being another close public school option.If you are looking to live in Shreveport but just a little bit outside the central part of town this area is a beautiful choice: a pleasing combination of unique and varied houses, nature, and still reasonably quick access to town. Highland is culturally diverse and has an eclectic character that makes it one of the most unique subdivisions in northwest Louisiana. It is located just south of downtown, between Stoner Ave. and Kings Hwy. This location provides easy access to I-49 and I-20 as well as Line Ave and Youree Dr. The neighborhood is a cornucopia of architectural styles: Victorian, Queen Anne, Bungalow, American Foursquare, American Craftsman and Tudor and Spanish Colonial . Some of the homes are affordably modest, others, such as those in the Fairfield Historic District, are opulent mansions and estates. In this area, your sure to find something at any price point. The neighborhood thrives from the respected Centenary College, and is home to many of the cities cultural cornerstones. Churches and theaters, boutiques and antiques, as well as some of Shreveport's oldest and most cherished restaurants.Highland is home to entertainment and fun! It has it's own Jazz and Blues festival every fall in Columbia Park, and has its own Mardi Gras Parade that winds though the neighborhood bringing joy and multi-colored beads to many doorsteps. Highland Park has its own Frisbee golf course, as well as tennis courts. Families in Highland have a variety of school choices because of it's location and districting, so you are sure to find the perfect school for your child, public or private. the Haven is located in south Shreveport, between the Red River and E. Bert Koons, The homes in this subdivision are priced at $250,000 and up. The Haven offers both garden homes and custom built homes in the neo-ecclectic style.The Haven is on the river and offers waterfront property and a private boat launch for residents. The three lakes in the neighborhood are stocked with fish and are accented with fountains. The homes have very small but well decorated yards, which are maintained by the Homeowners Association, as well as the three miles of lighted walking trails. At the front gate, there is a guard house with friendly 24 hour security, providing extra safety for your family and property. And the levee the neighborhood sits behind provides a great noise and light barrier from LSUS and East Kings Hwy.The Haven is less than a mile from the most popular shopping and dining in Shreveport/Bossier, and is also only a few short minutes from two state-of-the-art medical centers. The Haven is also located in one of Shreveport's most ideal school districts. The nearest school district to the base is the Shreveport-Bossier City school district which has 17 elementary schools, 7 middle schools, and 6 high schools for students from K-12. Higher education facilities are also available and include Louisiana Tech University, Southern Illinois University and Northwestern University.